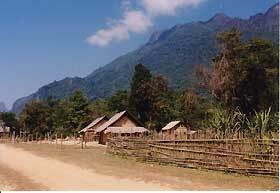 Laos is a landlocked country surrounded by Vietnam, China, Burma (Myanmar), Thailand, and Cambodia. Because of its peripheral position, the country has been influenced politically and socio-culturally by these neighboring countries for many years, and this influence continues even after the Indochina wars, communist revolution and the introduction of the New Economic Mechanism. On the other hand, this mountainous country still has rich natural resources, although they have recently undergone strong domestic and international pressures both of exploitation and conservation. As a result, the livelihoods of local peoples have changed drastically. The situation of people, society, and nature in this country was hidden behind a thick veil after the 1975 communist revolution, a time during which foreign researchers were shut out. But the recent open-door economic and cultural exchange policy and the need for research cooperation on some important issues, including development and environmental protection, have re-opened opportunities for foreign researchers. The joint research at the field station (FS), called “Local Natural Resource Use and Society in Laos,” examines the changing relationship between local society and natural resource use through field surveys. 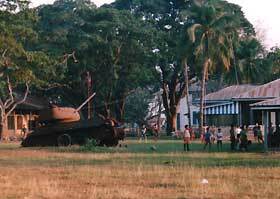 A city scene: the children are playing football near the wreckage of a tank. The research group has maintained contact with counterparts and had made preparations well before the application for the 21st COE project. On May 30, 2002, we succeeded in signing an MOU with The National University of Laos (NUoL), and with its Faculty of Forestry (FoF) on Sep.27, 2002. Under these MOUs, we opened the FS office from Dec. 13, 2002 on the 1st floor of the administrative building, Faculty of Forestry, the National University of Laos. The author stayed in Vientiane from Dec. 13, 2002 to Mar. 25, 2003 and engaged in preparatory activities and on-site research & education. The office infrastructure and on-site research & education system are improving step by step. Currently the FS is being utilized as a base for on-site research & education among Japanese and local researchers and students. A village scene: peaceful and silent at first glance, but a wave of change is certainly coming. 1This report includes activities before and after my stay in Laos. 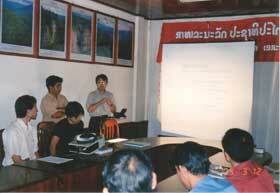 This was the first time for the author to visit Laos for research. Therefore I first reviewed references to understand the basics of Lao society. Second, I reviewed natural resource policies to understand the Lao context of policy change. Finally, I looked for interesting research topics through accompanying short-term field trips. Many field studies covering the north, south, and central regions, are currently being conducted and planned under the FS project to highlight the changing relationships among people, society and nature in Laos through an inter-disciplinary approach. In the mountainous north, studies on shifting cultivation, forest conservation, utilization of non-timber forest products, and expansion of cash crop are being conducted. In the central plain, research on the development process of rural handicraft production and marketing systems is planned. 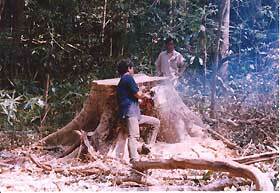 A land use survey in the Nam Theun watershed is also planned. In the south, a region with paddy plains and deep forests, various studies are being implemented in Savannakhet province: a vegetation survey of the paddy fields and forests, fish and fishery survey, and annual ring survey in the logged-over forests, etc. Research assistance to graduate students is done through field seminars, daily conversations at the FS, occasional discussions by E-mail, and, most directly, by having the author accompany them into the field. Long-term field surveys may force researchers to be lone scouts, and they may sometimes fall into self-satisfied ways of thinking. The on-site education activities at the FS try to overcome this problem. Up to now, the following studies and students have been given such educational assistance. In addition, field seminars were held as follows. They are held whenever necessary. Currently, another field seminar on the progress of the project is planned for Mar. 2004. 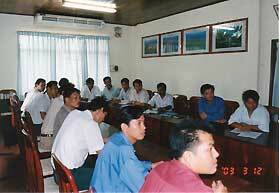 Since its establishment, the Laos FS has been utilized as a base for on-site research & education. The research cooperation is carried out not only by ASAFAS, FoF and FoA (Faculty of Agriculture, NUoL), but also by the Graduate Schools of Human and Environmental Studies, of Agriculture, and of Letters at Kyoto University. In the near future, cooperation will be extended into other faculties of NUoL and related research institutes in Laos (such as NAFRI). Cooperation with other related research projects in NUoL will further enrich our experience.